Shift your spa experience from the daunting task of lifting the cumbersome cover to enjoying your spa more often than ever before. 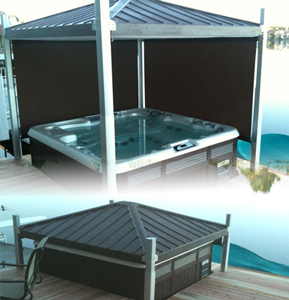 The Covana is an automated all in one spa cover/gazebo enclosure that rises above your spa at the turn of a key. Enhance your spa experience with the Innovative Covana, the world’s first fully automated all in one cover gazebo! For more information on this product, please visit our Covana Spa Cover Enclosure webpage or contact your Export Manager TODAY!